Tika’s humor inspired the Tripawds BBQ apron. And what better way to barbecue – or bake bread for that matter – than in style!?!? Tripawds style that is … this funny yet fully functional apron was inspired by the fun discussion about Tika’s great camping adventure, and the comebacks people come up with for silly comments abut their beloved three-legged friends. It features the punchline of a joke we were told by a Native American who saw Jerry at Lake Bemidji in Wisconsin, and is solely intended for those who agree laughter is the best therapy. The Tripawds Apron is ideal for any chef – in the kitchen or at the BBQ – and can be found in Jerry’s Café Press Tripawds store, along with many other less crude t-shirts and gift items, including the 2010 Tripawds calendar. Save $10 at Cafe Press Today Only! Ha, I can’t believe you made it into an apron!! I’ll have to think long and hard about who would like this as a gift. Me, well, I’m not much of a cook – thank goodness for Tazzie! I want a t-shirt with that on it! What a great idea. 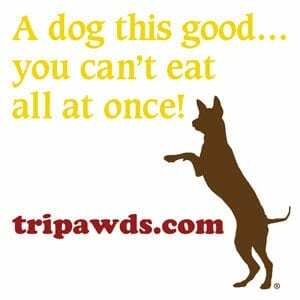 Stay tuned for a wider selection of all Tripawds apparel and gift items!